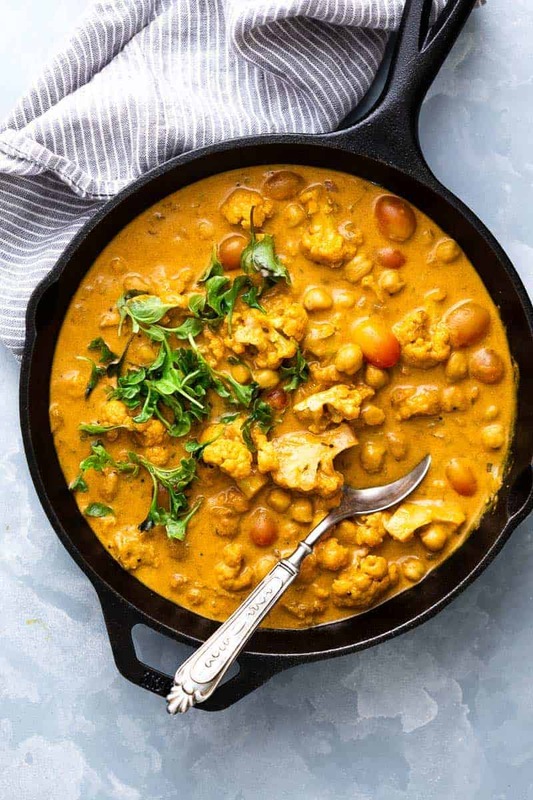 This is a classic coconut curry with tender cauliflower and soft chickpeas thats all made in one pot and has a simple mix of spices. That sauce is super addictive and you’ll love how easy it is to make. It’s vegan and gluten free, but you can easily add chicken or shrimp if you prefer meat. I have an incredible number of cookbooks that I don’t use as often as I should. And I recently ordered another one, written by a super sweet blogger friend Asha from Food Fashion Party called Masala and Meatballs. 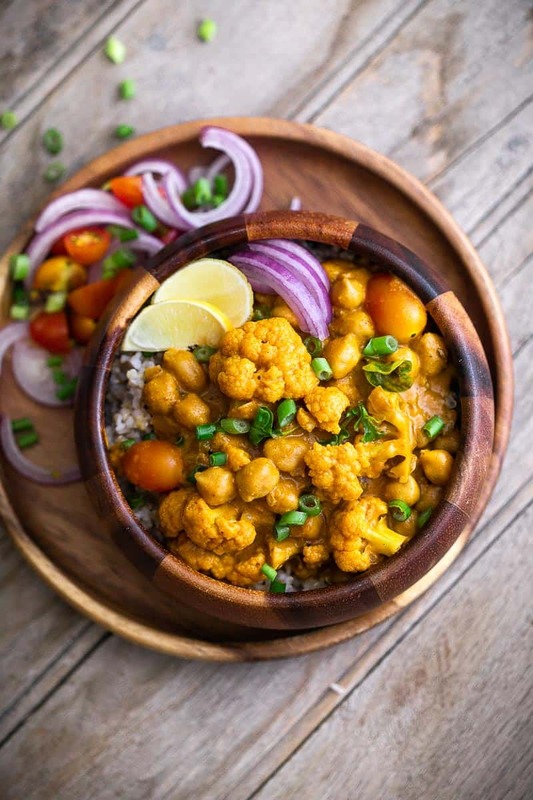 I was rifling through the book and taking in the beautiful photographs and writing when I noticed this super simple Cauliflower Chickpea Coconut Curry and I just couldn’t get past it. It sounded so easy and yet, I knew that it’d be packed with flavour because it was Asha’s recipe. She has the most amazing Indian inspired recipes on her website and she always finds a way to use spices to add magic to western food. This curry definitely has its roots in India, but the beauty is how flavourful it is with such few ingredients. I have to warn you though. I went to the dark side with this recipe and used Curry Powder. If you’ve ever discussed curry with an Indian, you’ll know that we don’t have anything called ‘curry powder’. And there is no real generic spice mix except garam masala. But I’ve been so curious about this that I picked up a box sometime ago and got quite addicted to it. 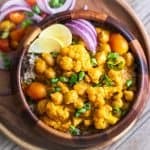 I use it in scrambled eggs, and to spice hummus and recently in this cauliflower chickpea coconut curry. If you are curious about it, I use the ‘hot’ version of this curry powder, but it’s not available on Amazon right now and I think this curry powder is pretty close in flavour. 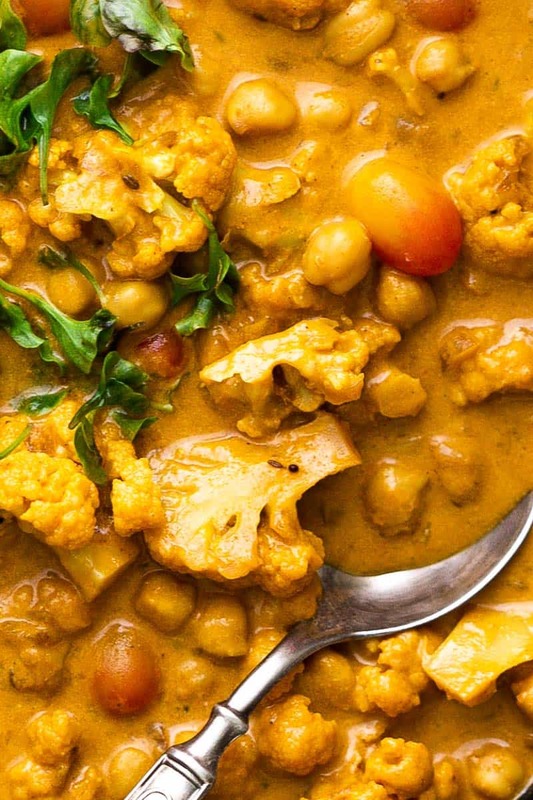 We are using only three main spices in this cauliflower chickpeas coconut curry – turmeric, curry powder and paprika (or red chilli powder). If you don’t have access to curry powder, substitute it with 1 tablespoon coriander powder, 1 teaspoon cumin powder and 1 teaspoon garam masala powder. These simple spices go a long way in flavouring this curry and adding a nice punch to the sauce. What else can I use in a coconut curry? The base of this curry is coconut which is flavoured with onions, tomatoes, ginger and garlic. When the spices go in, you have a fragrant sauce that’s perfect with rice or rotis. I loved the combination of chickpeas and cauliflower, but other vegetables that work well are beans, mushrooms, potatoes and carrots. If you like to add more protein, experiment with tofu, paneer, chicken and shrimp. The cooking times will vary for each of these. For example, potatoes need to be simmered for at least 15-20 minutes to cook them properly. Chicken (cut into small pieces), will also take 20 minutes to cook, but if you are using shrimp to make a coconut shrimp curry, cook them for 7-8 minutes. No matter what you add to it, you can’t go wrong with this coconut curry! Its punchy, full of flavour and you will literally need 30 minutes to prep and cook. Oh my god, girl, thanks so so much for the love and this beauty. I am blow away. Thanks from the bottom of my heart. I’m so glad you loved it. It was such an incredible recipe Asha that it was easy to fall in love with it. Your book is fabulous!